Sometimes, even those that don’t like driving and don’t enjoy high speeds can be captivated by the design of a car. 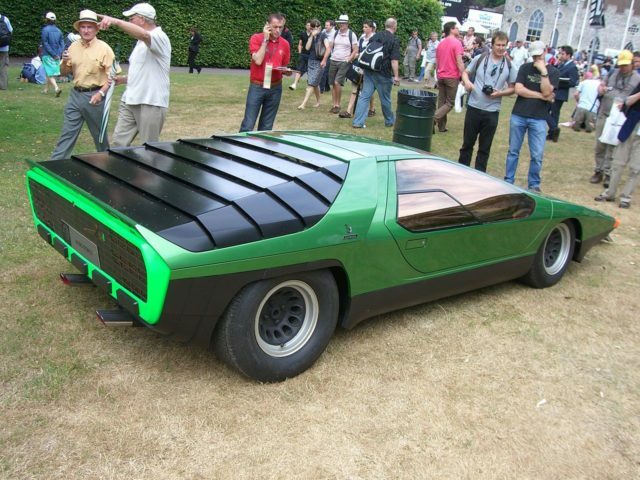 The Alfa Romeo Carabo is one such head-turning vehicle. It’s a pity it was just a concept car, and there are no more of those on the streets today. 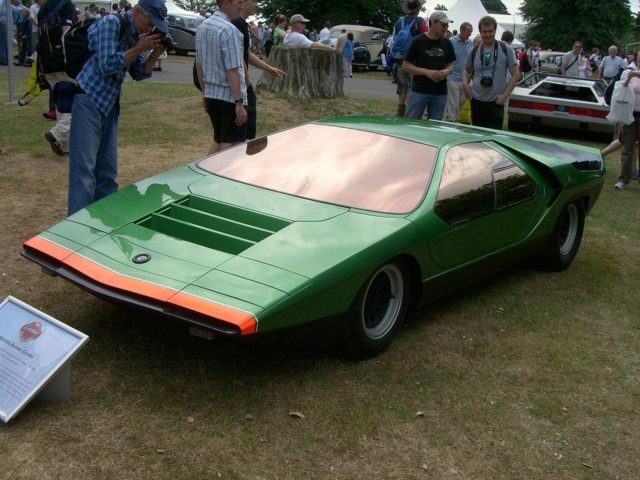 The Alfa Romeo Carabo was revealed at the 1968 Paris Motor Show. The designer, or should we say, artist, that shaped this car was Marcello Gandini from the car design company Gruppo Bertone. For those who don’t know, Gandini was an Italian car designer that left his signature on many famous and beautiful cars such as the Lamborghini Countach or the Ferrari Dino. The name Carabo was inspired by the Latin name of the ground beatle insect family, Carabidae (probably because of the Carabus auratus, the golden ground beetle). With its glittering green and orange coloring, the car is reminiscent of the outer shell of the ground beetles. 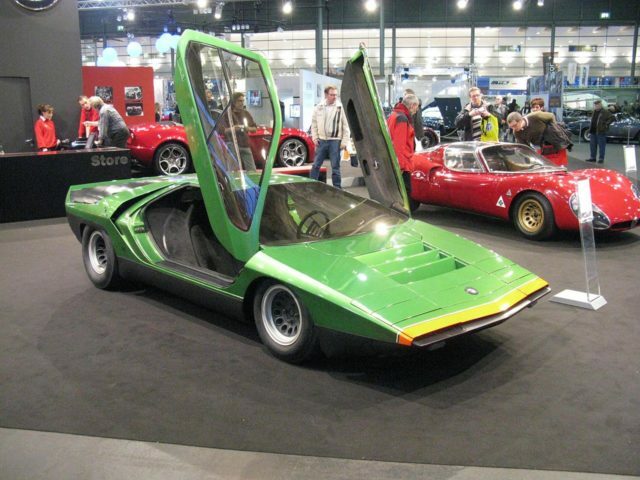 The Alfa Romeo Carabo has a distinctive “wedge design” that became popular in the late 1960s. Because of its uniqueness, this car is considered as a role model for every wedge car, and as a direct predecessor of the Lamborgini Countach. 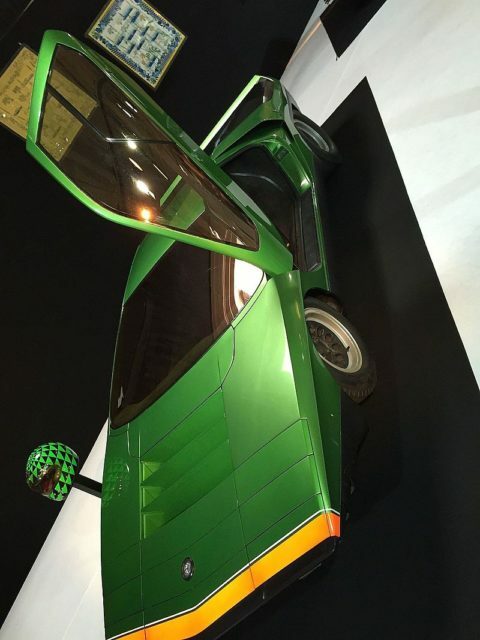 The Carabo design left its mark on many cars that appeared in the next decade. 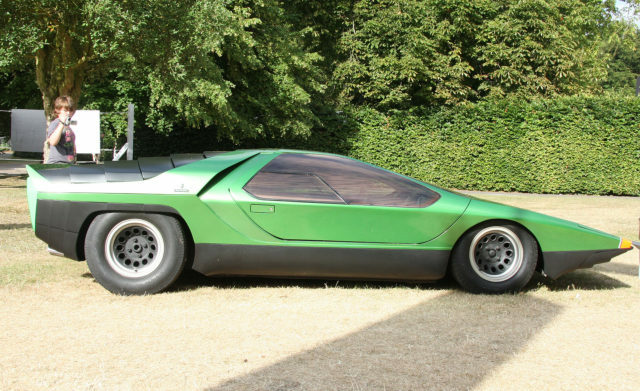 Underneath the futuristic appearance, the Carabo has the chassis of an Alfa Romeo 33 Stradale. This beast was propelled by a 230 bhp (172 kW; 233 PS) at 8800 rpm engine, which with the capability to reach a top speed of 250 km/h (155 mph). Although it was never destined for production, the car was fully functional with some pioneering features that never appeared on cars before. One such feature was the scissor doors. Unlike other cars from the period, the Carabo was not a collection of forms. Instead, it was simplistically designed as a single chopped mass. This Alfa Romeo wasn’t curved; the base shape from wich it has been developed was a flat front panel. Today, there is only the original Alfa Romeo 33 Bertone Carabo and a replica built on a De Tomaso Pantera chassis. The latter was made by Sam Foose (father of Chip Foose) after he wasn’t able to obtain the original prototype from Bertone.